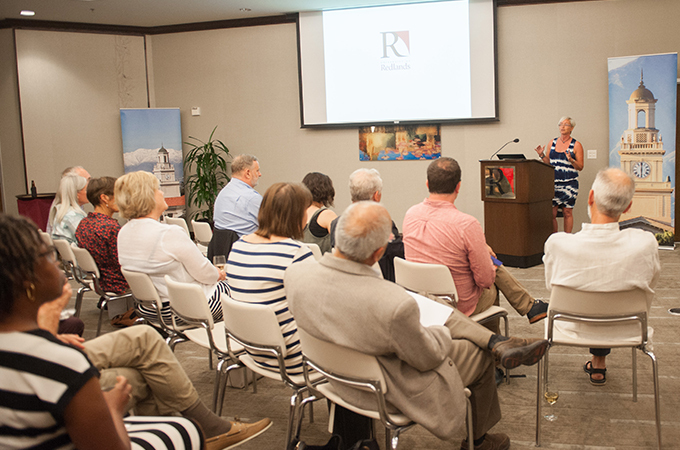 On May 10, University of Redlands faculty, staff, and administrators gathered in the Armacost Library for the sixth annual Our House event, a celebration of the research and creative endeavors of faculty and staff. Faculty members from across the University presented their work in fields including finance, psychology, music, education, and religion. A booklet also listed faculty achievements, from journal articles to books to compositions, performances, and exhibitions. The name for the event and publication was inspired by Professor Art Svenson’s speech titled “Our House” at the 2013 inauguration ceremony for President Ralph W. Kuncl. New to the publication this year was a section dedicated to multidisciplinary seminars: groups of faculty and staff members involved in the discussion of a specific topic. Professor of Environmental Studies Hillary Jenkins revealed the collaboration that occurred across campus and within her multidisciplinary seminar Mapping Outside the Lines, bringing together a group of women who explored the interdisciplinary intersection of gender and geographic information systems (GIS). During a presentation about his new textbook, The Art and Science of Trombone Teaching, Dean of the School of Music Andrew Glendening said recognition of faculty scholarship is what stood out to him when he accepted a position at the University. View the 2018 edition of Our House and look out for longer faculty features in the Bulldog Blog. Explore InSPIRe@Redlands, a repository of the research, scholarship, and creativity of the University of Redlands scholarly community.